TOLEDO, OHIO - The Durham Bulls earned a 6-5 victory over the Toledo Mud Hens Thursday night at Fifth Third Field, squaring the best-of-five Governors' Cup First Round series at one game apiece as the series shifts to Durham. 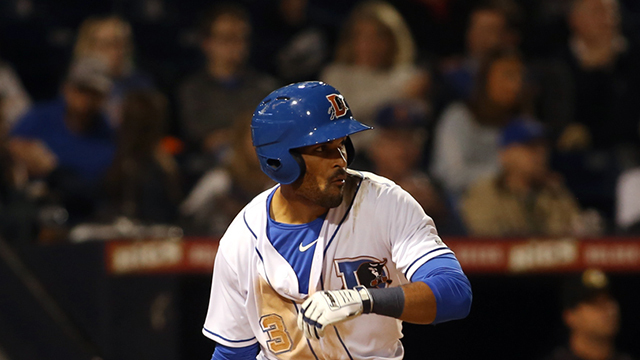 Micah Johnson sparked the Bulls, finishing the night 3-for-4 with three RBI and a run scored. The designated hitter gave Durham an early 1-0 lead with an RBI single in the second inning, and delivered the go-ahead blow with a two-run triple in the eighth inning, breaking a 3-3 tie. After his triple, Roberto Pena lifted a sacrifice fly to right, plating Johnson and giving the visitors a 6-3 lead. In the bottom of the ninth the Mud Hens made it a 6-4 game and loaded the bases with nobody out. Hoby Milner then entered the game and induced a sacrifice fly as the score flipped to 6-5, before earning a double play to close the contest. After Johnson's RBI knock in the second, Toledo scored a pair in the bottom of the frame for a 2-1 advantage. The Bulls struck back in the third on a sacrifice fly off the bat of Brandon Snyder, knotting the game at 2-2. In the fourth the home side took the lead once more, as Will Castro launched a solo homer to right. Snyder countered in the fifth though, again lifting a sacrifice fly to score Joe McCarthy, and tie the game at three. McCarthy, Kean Wong, Nate Lowe and Jason Coats all finished with two hits for the defending Triple-A champions, and Kyle Bird picked up the victory by tossing 1.2 scoreless frames out of the bullpen. Hunter Cervenka took the loss after surrendering one run in one inning of relief. The series shifts to Durham for Games 3, 4 and 5 (if necessary), with Game 3 scheduled for 7:05 p.m. Friday at the DBAP. RHP Chih-Wei Hu (5-7, 4.66) is scheduled to start for the Bulls opposite RHP Spencer Turnbull (1-1, 2.03) for Toledo.